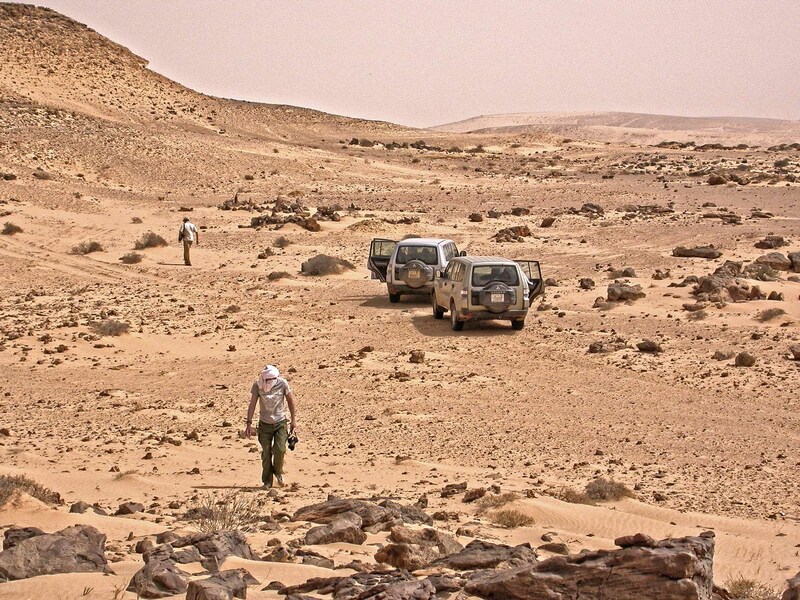 1st Expedition to the Saquia al Hamra and Western Sahara, 2010. With three off-road vehicles we had covered the 600 kilometers from Agadir into southern Morocco within eight hours. Our friend Mohamed had joined us in Agadir. In the village of Tan Tan he picked up his assistant Hassan. A happy go lucky fellow, who was obviously pleased to escape everyday life of his village for a couple of days. Full of expectation towards the great adventures which the arrival of the curious strangers would surely bring, he smiled at us from the passenger seat of Mohamed’s Toyota. 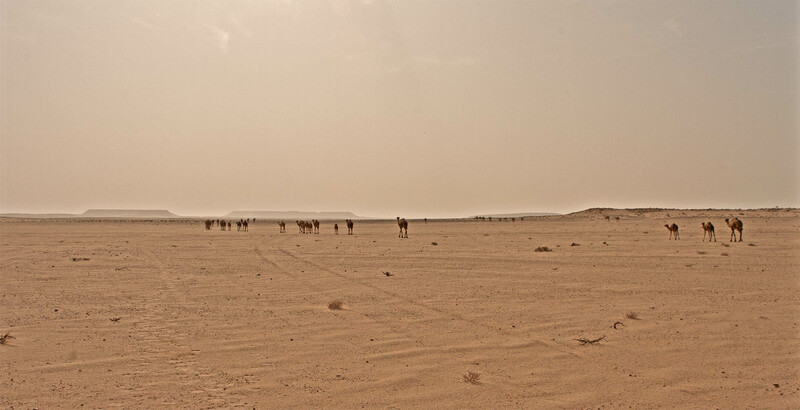 To the border of the former Spanish colony of Western Sahara it was only a short distance. At 27° 40′ N the thin red line cut ruler-straight across our maps. Underlining Morocco’s claim to the Western Sahara the border is unmarked, or rather, there is no border whatsoever. After all, the majority of the Western Sahara today is governed by the Kingdom of Morocco. The former borderline is invisible to the unsuspecting traveler who still finds himself in Morocco. Just as little as he becomes aware, that the government of the “Sahrawi Arab Democratic Republic”, (SADR) has not abandoned its claims to the Western Sahara. The Western Sahara dispute broke out in 1975 when Morocco annexed the territory after Spain relinquished its colonial grip on the arid, but phosphate-rich strip of land. The next 16 years were marked by a low-intensity guerrilla war. Since 1973 the Algeria-backed Frente Polisario, the military wing of the SADR, has challenged the claims, first of Spain, and later of Morocco, to the disputed territory. 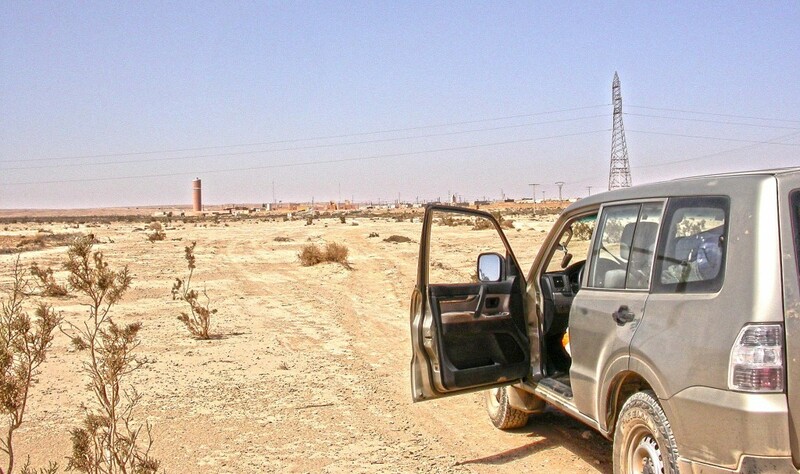 In order to view the telltale signs of the conflict which largely came to rest since the 1991 peace agreement, the traveler has to abandon the asphalt track to Smara and drive east for a few kilometers. There, passing along the Krabychat ridge, and less than an hour from the road, stretches the first of six sand berms built to protect the Moroccan governed territory from infiltrations of the Polisario rebels. From 1982 until 1987 Moroccan engineers subsequently erected six of these walls. Each pushing the controlled territory further south and east and into the direction of Mauritania. The wall itself, called “la ceinture”, “the belt” or “the berm”, by the locals, is a two to four meter high anti vehicle wall, protected by bunkers, wire obstacles and minefields. Ground based radar systems were installed to detect vehicles approaching through no mans land up to a distance of thirty kilometers. The outer eastern wall is heavily fortified with its bunkers manned even today. Today the inner walls deep within the secured territory are left to the eroding forces of nature. The sangars and foxholes are filled by drifting sand, and the derelict bunkers are taken over by scorpions and desert foxes. In some places gaps in the old walls and fresh tire tracks indicate that the nomads resumed their century old Alamat-marked trails. The old minefields are cleared; at least that is what the locals tell us. However, we have no ambition to test the soundness of their assertion. Instead we plan to pull from the track and cross the desert in the opposite direction. There the mighty seventy kilometer wide erosion delta of the Saquia al Hamra begins. Its center is marked by the still active Qued of the Saquia. Its present day river bed is only several hundred meters wide and seamed by a luxuriant belt of acacia, tamarisk and calotropis. Where the thin belt of vegetation ends, Pleistocene river terraces expand to the north and the south, their coarse gravels showing millennia-old desert patina. At the northern fringe of these terraces the slopes become steeper and ascend into the gorges and canyons of the Jebel an-Nakech and the Jbilet Algwireb which in turn lead up to the Hamadas of the Al Gada plateau. The southern edge of the mighty delta is bordered by the Tifiquirn massif, a bedrock plateau composed of isolated mesas intersected by a south to north-oriented system of deep Queds and erosion channels tributary to the Saquia valley. At the Tifiquirn’s easternmost finger the storied monolith Tbeila towers above the plain. A sacred rock where Sheikh Ahmed Laaroussi once performed his prayers. Further to the south-east, beyond the Wadi Tighzert, and interrupted by only a few dips, expands the Dayet Hamada. In the south its grey and red gravels extend as far as to the phosphate fields of Bou Craa. The erosion delta with the Qued of the Saquia al Hamra forming its central east-west-oriented axis cuts through geological layers from the middle Devon to the recent Holocene. South of the Saquia, between the Tbeila and Smara in the east, mesas built of dark weathered Devonian sandstone and shale rise above the Quaternary Ergs. Fossil coral banks are weathering out of their flanks, witness to a tropical reef 380 million years ago. The Tifiquirn in the south, and also the Al Gada in the north, rest on basements of Carboniferous shale and sandstone, covered by layers of Jurassic limestone and dolomite. The latter are rich in sequences of chert which occur in colorful interlayered ribbons. Depending on the degree of faulting and erosion the recent Hamada surfaces of these plateaus are composed of several of these strata. Hamadas of sharp edged limestone and grey dolomite breccias alternate with Regs composed of shattered red and brown sandstone gravel. These are intersected by vast stretches of weathered black chert which in turn encircle isolated patches of bright marl. In patches these surfaces represent the full spectrum of the abundant rocks which leads to a chaotic variety of colors, size grading and particle shapes. For the initial purpose of the expedition, the search for meteorites, these inhomogeneous surfaces presented rather suboptimal conditions. If any, they offered only weak contrast to the usually dark space rocks we were prospecting for. Nevertheless, for the area along the Saquia valley and its tributaries previous meteorite finds were known, even though only two of these, Northwest Africa 456 and Northwest Africa 773, were documented in the Meteoritical Bulletin. Because only a fraction of meteorite finds in Northwest Africa are reported with a set of find coordinates, we assumed a certain proportion of unreported finds for the area. Our approach was to narrow down the quantity of this proportion. Our team shared the conviction, that surface ages in the area alone were adequate to allow a critical rate of meteorite accumulation. With some determination it should be possible to find meteorites in situ and collect sufficient data to prove that meteorites in the area were more abundant than the figures in the Meteoritical Bulletin suggested. But at this stage of the project this was all just theory. Support, at least we hoped so, we would get from the local nomads to whom our friend Mohamed, a meteorite dealer by trade, and a good one, already administered best relations. Meteorites, and this was nothing new to us, did not grow on trees, not even in Morocco. Because Mohamed understood our field expedition also as a business trip, he was busy answering and receiving calls from informants and suppliers on his cell phones as long as he had net coverage. At times we would see him standing on the crest of a dune, a cell phone to each ear like a stock trader, making appointments and negotiating purchases. For the latter purpose he had arranged a meeting with a group of suppliers at a desolate gas station along the road to Smara. It was the last occasion before we would pull off the asphalt track and head inland and into the desert. At our arrival a number of battered Land Rovers already parked behind a warped brick wall, their owners drinking tea in the shadow. Swiftly a carpet was unfolded, and with grand gestures the carefully newspaper-wrapped stones were pulled from the depths of their raiment. In a crack a powerfully eloquent negotiation was in progress which one could easily follow even without speaking the local idiom. The chief envoy of the gang, a cunning Tuareg named Ousaaid, praised their stones in flowery language while he held them up in the light of the sinking sun as if to test the immaculateness of diamonds. At the same time Mohamed, the experienced negotiator that he was, tried hard to appear particularly bored. Demonstratively nonchalant he looked at the one or other stone while murmuring something which possibly meant, that one could as well have spared the trip, given the low grade quality of the merchandise presented. Slightly confused by such cold blooded negotiation skills Oussaid put on the table his lowest ever special-friendship-price for one of the achondrites being discussed. With a short giggle, attesting his counterpart a seriously diminished accountability, Mohamed refused the sum of a few Dollars as exorbitant and absolutely beyond discussion. Ousaaid, who quickly regained his countenance, hereupon challenged Mohamed’s eyesight and continued to praise his goods to the sky in a torrent of words. This went on and on. The archaic ritual which was already executed following the same protocol at the campfires of the first savanna dwellers went on for another while. Finally both parties agreed to terms of conduct. A firm handshake settled the deal. For us it was interesting to learn, whether the merchandise represented meteorites from find locations nearby or from places farther away. The finders willingly disclosed their knowledge, in which they referred to the newspaper wrapping on which the respective rural place names and the names of the finders were noted. The names of the find sites, of course, needed additional explanation in order to assign them to areas within our knowledge. 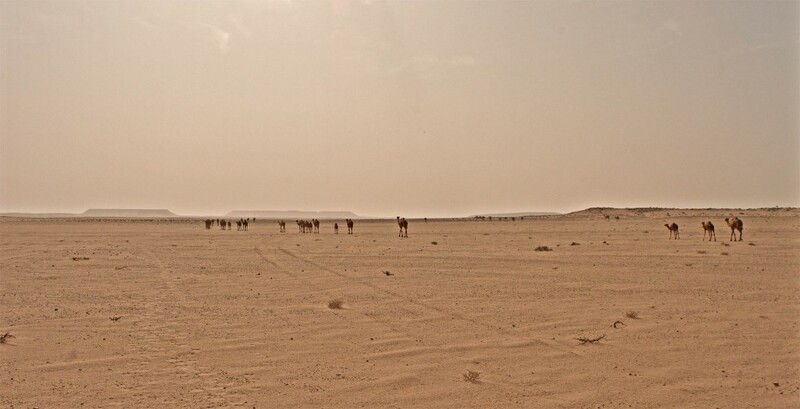 In the end we were provided with a good picture of how far some of the finders travelled to sell their meteorites. Some of the finds we learned, were already at that point second hand. The majority of the meteorites sold came from different regions near Assa in the south, Tan Tan in the north, and from the plains east of the central Wadi Draa. None of the stones was discovered in the area around the Saquia al Hamra, the search area we had chosen. We encouraged the finders to take down and to keep detailed records of when, where exactly, how many and by whom meteorites were found and to make sure that this information was passed on to eventual buyers. Part of the deal just closed between Mohamed and Oussaid was also a well-fed goat which Hassan now loaded into the back of Mohamed’s Land Cruiser. Because the sun was already setting we pushed to depart. To our surprise and without further ado the group of meteorite salesmen joined us, obviously because the area had little other entertainment to offer. We were happy about the unexpected company. Our caravan which had now grown to four vehicles left the asphalt road and turned west into the gravel plains which stretched to the horizon. Soon a mesa came into sight, sharply silhouetted against the sinking sun. I estimated its range at approximately eight kilometers. A distance we still could make in the remaining light. I headed for the landmark and the others followed. After barely an hour and with darkness settling we arrived at the landmark. At its southern edge we discovered a horseshoe-shaped bay which perfectly qualified for the night camp. Under the rising moon we pitched our tents.